Well, where to start? I always wanted to go to Texas Technological College (now a university) so I applied as a Petroleum Engineer. I got back my application, but it was marked “Physics”. I quickly changed my major to Engineering Physics so I would at least be in the right school. Midway through my junior year, the Dean of the School of Petroleum Engineering announced that no woman had ever gotten a degree in Petroleum Engineering from his school, and no woman would as long as he was Dean. I thought “What can he do?”, but found out quickly when I received a C in a course in which I had a 97 average. I transferred to Purdue on an impulse, only to find out it had no Petroleum Engineering school, so just spent one semester there. On the way home to Texas from Indiana, my mother insisted I stop in at the University of Oklahoma, where I not only got a scholarship, but found out two women had already graduated with degrees in that field. Both women had fathers in the business, which I later found out was a huge advantage. I was given special dispensation to sit wells (pull an all-nighter waiting for the well to come in, remember, we had curfews then), learned to drink coffee black, and all sorts of other useless skills. I graduated on the Dean’s List, then I went about looking for a job. My first (and only) interview while in college was with Phillips Petroleum Company. I was the only person sitting in a long row of chairs outside the interview rooms. I saw the door open to the interview room, and a man looked up and down the row. He went back inside. I heard him say to his male colleague “Well, you go look!” The other man came out and looked up and down the row. He went back inside, and they conferred. Finally, the door opened again, the man cleared his throat, and asked for “Mr. Powell.” I raised my hand, saying it was “Miss Powell” (my maiden name), and went into the room. It was patiently explained to me that they were representatives of Phillips Petroleum and were looking for Petroleum Engineers. I told them that I had a degree in Petroleum Reservoir Engineering and was on the Dean’s List. They looked incredulous – “You honestly thought we would hire you?” they asked. I suppose I did, but after they tried to help me by telling me of an opening at Esso (later Exxon) for an Engineering Librarian, which would be right up my alley, since I knew the language, I told them I was thinking about going back and getting a degree in Home Economics (which I wasn’t, of course, but I thought they would like to hear that.) They agreed that this was a wise choice, patted me on the head, and told me goodbye. Remember this was 1961, so no one thought of suing back then! My dad called soon after and said that the head of the Fort Worth office of International Business Machines corporation wanted to talk to me. (This was the same dad who had advised me to get my teaching certificate. I suppose he knew that I could never get a job as a Petroleum Engineer and wanted me to have something to fall back on. I didn’t listen.) IBM was known for hiring odd-balls, and since I was an Oklahoma Beauty nominee and the third woman to graduate in the US with a degree in Petroleum Engineering, I guess I qualified. I had never programmed a computer, but was hired. Received a lot of guff from the guys in PE, wanting to know where IBM was drilling these days, but at least it was a job. Needless to say, the male employees were called Systems Engineers, and the female employees were called “Systems Service Girls”, and that time women weren’t allowed to be salesmen, but it was a job! I went to a two-month “kindergarten” in Dallas, where I learned to wire unit record equipment. At that time, unit record equipment was the big deal, and it read punch cards and calculated values, sorted them, etc., based on the way wires were plugged into the devices. It was sort of interesting, but after graduation I was sent to Shreveport and immediately put to programming (which I knew nothing about). I programmed the 4K (that’s right…four kilobyte!) 1401 using punch cards and the Symbolic Programming System (SPS). After I got the hang of it, I couldn’t believe I was making money for doing something which was so much fun. I loved programming, and took to it like a duck to water. I did use my Petroleum Engineering training at first, writing programs for Western Geophysical and others, but soon discovered FORTRAN and COBOL and never looked back. I remember the first computer which I saw with ONE megabyte of storage…it took up a whole room! IBM then sent me to San Jose, California, for a school in programming, which of course, I had already learned. Then I was transferred back to Fort Worth, where I was assigned to Federal Sales, teaching Unit Record equipment again. Whenever I hear people complain about the inefficiencies of the federal government, I just think back to my early years with IBM! Eventually, I was married to a career Army officer (he was one of the prime contacts IBM had at Fort Hood, where I was assigned to teach unit record equipment), and moved around a lot. I worked for UNIVAC (Sperry Rand Corporation) among others, and finally decided that if I was going to be moving around with Ray in his career, I should work for the government, so at least I wouldn’t have to start over each time we moved. Since my husband was also in data processing, I knew I could find work wherever we went. I became the highest ranking female employee in the Canal Zone (GS – 13) and went back to Fort Worth when my husband retired. I worked for GSA, then transferred to the Naval Oceanographic Office in Bay St. Louis, MS and went on to be the first female Division Director in the 150-year history of the Navy. I quit my job and we went sailing for a year, best decision I ever made! I came back, worked for the Navy for a while, then transferred to USDA’s National Finance Center in New Orleans, where I became the first female Senior Executive, one out of 28 females (there were about 800 males with USDA’s Executive Corps) and the only female Senior Executive in the department outside of Washington, DC. I had a chance to meet Grace Hopper, who was the first female admiral in the Navy, and also worked on the ENIAC computer when it was first built. She was a hoot! My husband worked for the Navy, and we both then retired and moved (as usual) to Arlington, TX, to Southlake, TX, to Corinth, TX, and finally to Southern Pines, NC. My husband died two years ago, and I built a home on my daughter and son-in-law’s acreage, overlooking the pool and their house, so I keep the grandsons whenever they want (he’s active duty Army, stationed at Fort Bragg, NC, and has been deployed three times). It’s nice to be close to family but also nice to think that perhaps I paved the way for many women who might decide on STEM. 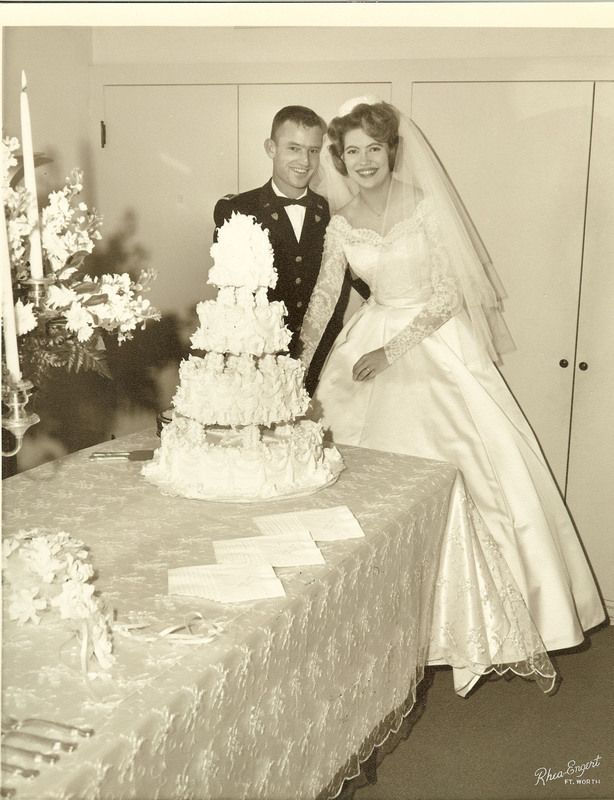 The picture at the top is of our wedding back in 1963…almost 50 years ago. Unfortunately, I don’t have any pictures of me at work, just memories. 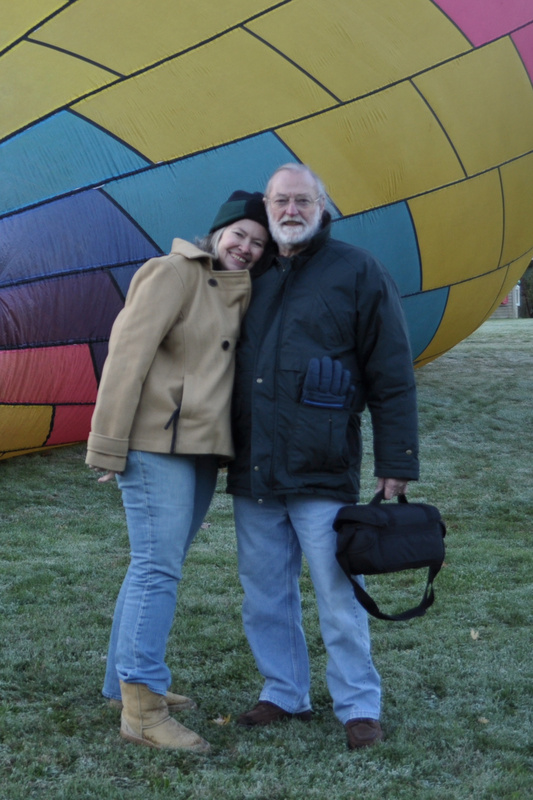 The picture below is of Sharon and Ray after a hot air balloon ride. This entry was posted in Computer Science, Engineering. Bookmark the permalink. That was so neat, and happy you remember, Michele. The teacher said at the beginning of the class that if we studied hard, someday we might be able to buy our own truck. I didn’t tell him I was making over $100,000 per year already. It did come in handy when we sailed, though, because I could tear apart the AC on our boat and put it back together. The people who built our boat were really impressed, because they assumed one would have to cut a hole in the cockpit and pull out the AC – didn’t believe someone could actually repair it in place. What a wonderful and inspiring woman! Thanks for telling your story. You remind me of my grandmother who led one of the first high school for girls in India (she also spoke out publicly in street protests against British colonialism) and was a mathematics teacher herself. Power to you, women could not be here today without pioneers like you. I am curious, how did you manage to keep going in spite of so much in-your-face sexism? Yes , Sharon is one of the most incredible women I have had the pleasure of knowing.